It’s getting hard to track how many parties are in on this hypercar. It’s the unspoken rule of the game, when you want reliable horsepower, you knock on John Hennessey’s door. When John Hennessey wants a gearbox that can handle the kind of horsepower that the Venom makes without splintering into a million metal bits, he makes a call to Ricardo. John Hennessey isn’t really a part of this equation, but horsepower sure is—900 of it to be exact—and Autocar informs us that it will be channeled through a seven-speed automatic designed and built by Ricardo for the Aston Martin Valkyrie. We already know that Aston Martin and RedBull’s brainchild will utilize parts from outside suppliers, the most notable being a naturally aspirated 6.5-liter V12 Cosworth engine that will lie in the engine bay of the £2-3 million ($2.6-3.9 million) hypercar. Supplemental electric power will be stored in batteries made by Rimac, and given how badly the Croatian hypercar demolishes a Bugatti Veyron, we’re expecting nothing less than otherworldly performance. With this new puzzle piece, we’re starting to get an image of a car built using the help of many outside sources. The Valkyrie’s main competitor is the Mercedes-AMG Project One, which seems to be an in-house project built using the experience the Tri-Star has in the field of Formula 1. The build philosophy behind the Valkyrie could not be more different. “Making the Valkyrie presents huge challenges. It’s a real test of everyone involved, but that’s as it should be, for we’re genuinely raising the bar with this car. That’s what makes the project so special, and why having the right technical partners is so critical,” said Aston Martin vice president David King. “Some of those names we’re working with are long-standing suppliers of Aston Martin, but there are some new names in there, too. Whether forging fresh partnerships or building on existing relationships, this project is a shared engineering adventure that we’re all relishing.” Thanks to frequent updates on the project, we’re enjoying it almost as much as Aston Martin and its team is. It’s neat getting this insight on both cars because in all likelihood, none of us will get to drive one. With Mercedes gunning for a pure hypercar built to define its AMG brand and Aston Martin using a medley of parts from outside suppliers to build one badass car, it’s as if the advantages and disadvantages to each are laid out plain to see. Ultimately, Aston Martin is taking a bigger risk. With so many suppliers to keep track of, the Valkyrie could end up with a scattered personality compared to the AMG. But If it wasn’t for the outside help, the smaller British automaker couldn’t compete in this realm at all. At least nobody has to fret about Ricardo’s credibility because the supplier has built everything from the gearbox of the old Ford GT to engines for McLaren. This round of whispers hasn’t confirmed whether or not the gearbox will be a standard automatic or a dual-clutch unit, but the deal does outline that it will be used on both the 150 road-going Valkyries as well as the 25 track-only versions. By the time a release date rolls around in 2019, auto enthusiasts around the world should be in for one hell of a treat. The only thing we're having trouble grasping is Aston Martin's weight claim. 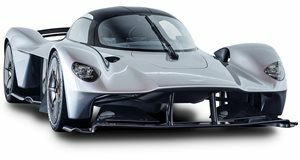 With a power-to-weight ratio of one-to-one, it seems a stretch that all of those parts, engine, transmission, hybrid system, and custom seats included, will keep the Valkyrie under 900 kg (1,980 pounds). Could it be that the impossible becomes possible in the Valkyrie?